Creating wireframes or mock-ups before coding can make it much easier to collaborate on designs and requirements. By structuring discussions around what the user will see, fewer things are left to interpretation. However, without testing the designs with the target audience, it’s an incomplete UX process. With Indigo.Design, all you need is a web-browser to go from prototyping to watching videos of how people used your prototype, and the best part is that you can create your designs in any tool you like. Yes, even Microsoft PowerPoint! To start creating your prototypes, visit Indigo.Design to sign in or create a free user account. After signing in, use the create new prototype option to fire up the web-based editor. Then simply drag and drop your Sketch document to import it. The best part is that you don’t have to recreate the flows that you may have created in Sketch. Now set a starting point, and hit publish. And that's it! You are all set to kick-off a usability study or share a link with others! If your Sketch document does not contain any flows, you can add them using this editor. To do this, enable the "Highlight UI elements" option, and then simply click on any highlighted Sketch element to add a hotspot. If you prefer to draw your own hotspots, leave the "highlight UI elements" disabled and drag anywhere on top of the image to add a hotspot. Don't use Sketch? No problem. You can add images created using any tool and still create and publish prototypes. You can set up a usability study for any prototype published on Indigo.Design. Creating a study lets you collect usability analytics and user videos for each participant. If you add the usability study to a group workspace, you can let any invited member analyze the reports and videos. You can even delegate the usability study responsibility to another member of your team. Study owners will receive email notifications with a study progress report as and when participants complete the study. The desktop app provides a WYSIWYG experience to create your prototypes from scratch. You can design screens by adding UI components from toolbox or from your own reusable design library. More importantly, the desktop app allows you to easily create UI states to simulate rich interactivity and custom transitions using an animation timeline. You can even import from Sketch using our Sketch plugin to add more interactivity. And naturally, you can use the desktop app whether you are online or offline! You can then publish your prototypes to the cloud or your on-prem server to get all the benefits of collaboration, commenting, and usability studies. Don't stop with prototypes; get it in the hands of real users with our 1-click sharing, and the ability to view prototypes on any device. Harness the power of Indigo.Design Cloud for recording user sessions and task analytics. Use our Essential Plan for free or upgrade to Indigo.Design Professional starting at $39/mo. Want Code Generation? 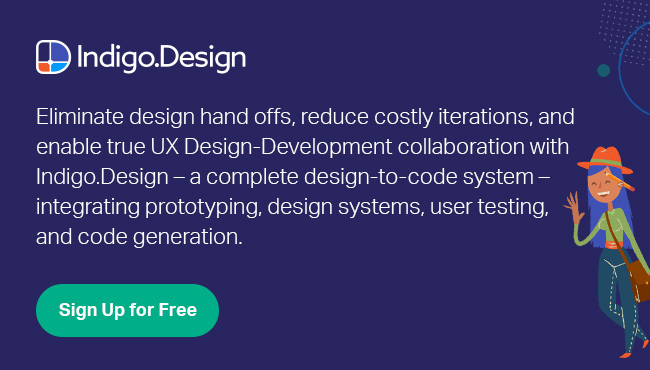 Get Indigo.Design Enterprise for $99/month!